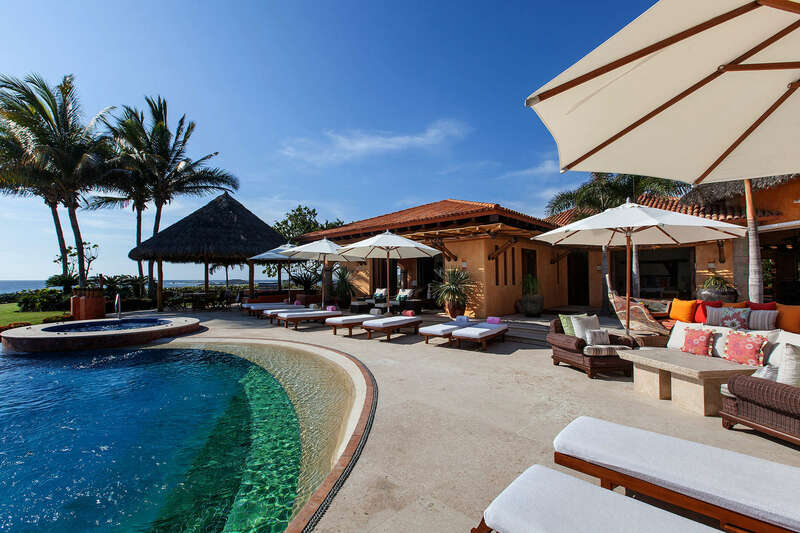 This is a sprawling, 20 000 square foot, private, ocean front estate nestled inside a gated community that includes the world class Four Seasons Resort and St Regis Resort, in Punta de Mita, Mexico. Designed by esteemed architect Marta Lozano, this property is rich in architectural details, abundant with antiques, and reveals incredible stone and wood handcrafted finishes. This spectacular estate boasts seven bedrooms, (four spacious ocean front masters, mountain view private villa, separate boys and girls guest bedrooms), 12 fully appointed bathrooms and five half bathrooms. $1,000 per additional guest after 16 (food included). Fully equipped kitchen and breakfast bar. Formal dining area and alfresco dining. Exercise room and massage room. Access to Hacienda de Mita Beach Club, St Regis Beach Club, Kupuri Beach Club and Resident's Beach Club. Two signature Jack Nicklaus golf courses (Bahia and Pacifico).